This page contains extensive division word problems replete with engaging scenarios that involve two-digit and three-digit dividends and single digit divisors; three-digit dividends and two-digit divisors; and advanced division worksheets (four-digit and five-digit dividends). 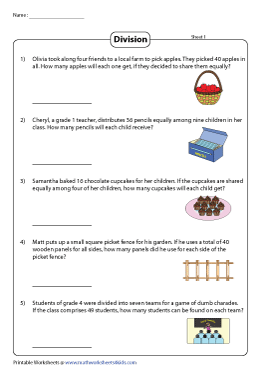 These worksheets feature simple division word problems. The divisors are in the range 2 to 9. The quotients are in the range 2 to 10. These worksheets are building blocks for children. This set of word problems involves dividing a two-digit number by a single-digit number to arrive at a quotient. The division leaves no remainder. Answer key is included in each worksheet. These word problems require the learner to divide the two-digit dividend by the single-digit divisor and write down both the quotient and the remainder. 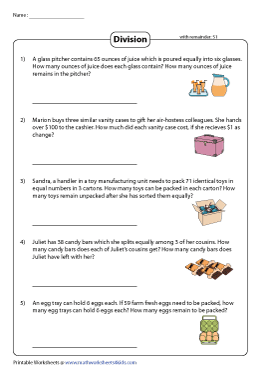 Three worksheets with 15 scenarios are featured here. Each worksheet has five word problems related to the given theme. Supermarket, School and Halloween party are the themes used here. These worksheets involve division word problems with three-digit dividends and single digit divisors. Apply long division method to solve each problem. This set of word problems will require the student to perform division operations involving three-digit numbers and two-digit numbers. Verify your answer with the answer key provided in the worksheet. 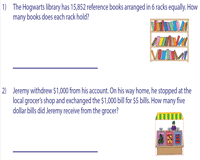 Interesting scenarios are presented in these advanced worksheets that involve four-digit and five-digit dividends and single digit divisors. Use long division method to find the quotient.